Archdiocese of Wellington – When is it ok to break the law? Home » Wel-com » When is it ok to break the law? When is it ok to break the law? Waihopai case highlights conflict between moral duty and the law. Dominican Fr Peter Murnane, Adrian Leason and Sam Land, calling themselves Anzac Ploughshares, were last month acquitted of charges of intentional damage and burglary in the Wellington District Court. At the time that Wel-com went to print, it was not known whether the Prime Minister John Key’s call for an appeal to be launched against the sentence would be answered. The actions of the protesters have drawn intense criticism from many people, including Catholics. The protesters never denied that they broke the law, which raises the question of when persons might be justified in breaking laws for what is perceived as a greater good. Catholic moral theologian John Kleinsman notes that Catholic moral teaching rejects the idea that a good end justifies the means. In general, this normally implies that we are not permitted to engage in immoral or unlawful activities. The common good calls for us to uphold laws because they are made with the well-being of society in mind. ‘Tensions are created, however, when a conflict arises between one’s moral duty to others and the need to carry out that moral duty by way of actions which involve breaking laws. However, John Kleinsman says, it is critical that people don’t just get bogged down about the nature of the protest action taken at the Waihopai satellite base or the outcome of the case. ‘While we shouldn’t avoid the legal and moral debate about what was done, what is also important, morally speaking, is the wider issue of what the protesters were highlighting – the injustices occurring as a result of the war in Iraq. ‘Putting aside the complex issue of whether what the protesters did was morally justifiable, these men were certainly not prepared to stand by and do nothing. Whether we ultimately agree or disagree with their actions, they represent a challenge to all of us who have done nothing! ‘They have made me think hard about my own lack of interest and effective action on this matter. 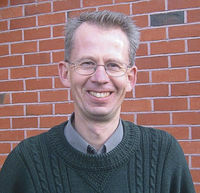 John Kleinsman noted that the Catholic moral tradition, in the form of just war theory, allows for countries to go to war as a means of self-defence. ‘One of the key determinations to be made in judging whether a war is “just” is whether such a response is in proportion to the threat. With respect to the war in Iraq there are now good reasons to believe that in reality the threat did not match initial perceptions. ‘There has been much speculation about why this is. Whatever the case, the question now is: What is the most responsible thing to do for the people of Iraq? How can we best establish peace and order and restore self-governance? To what extent is the ongoing presence of foreign troops assisting or hindering this? These are difficult questions. ‘As a result of the invasion, there has been a real loss of political and social equilibrium along with the destruction of much if not most of Iraq’s key infrastructure. ‘The countries who spear-headed the invasion have to shoulder considerable responsibility for this state of affairs as well as for the thousands of innocent lives that have been and continue to be lost. The ongoing deaths of innocent civilians, many of them women and children, as a result of fighting, sets an extremely high threshold for justifying any ongoing military involvement. John Kleinsman also commented on the fact that New Zealand has a long and proud tradition of conscientious objection and pacifism, beginning with Te Whiti o Rongomai and Tohu Kākahi of Parihaka and continuing with the likes of Archibald Baxter and others in the first world war. ‘These people were working out of a sense of the common good and I see the Anzac Ploughshares group as continuing this tradition; a tradition rooted in, and characteristic of, the early Christian Church,’ John Kleinsman says. As Pope Benedict writes in his latest encyclical Caritas in Veritate: ‘In an increasingly globalised society, the common good, and the effort to obtain it cannot fail to assume the dimensions of the whole human family … the community of peoples and nations in such a way as to shape the earthly city in unity and peace’ n.7.